Anusha Bawany chats with two amazing young talents about their debut collection, entrepreneurial success and their collective love for shoes! MIARA: We always felt that there was a gap in the market when it came to good quality yet affordable shoes. There was a serious dearth of brands catering to our cultural dress as well. Being serious shoe addicts, we wanted to create something that we would personally buy and create products we would be comfortable with putting our names on. SAADIA: That was our first rule when we started; we are only going to make what we would wear ourselves, and only charge what we would pay ourselves. WHAT INSPIRED MIAASA? WHERE DID THE NAME COME FROM? MIARA: That was all Saadi! The minute she suggested it, I knew it was the perfect name. SAADIA: It’s not as exotic as it sounds, it’s actually an amalgamation of both our names: Miara + Saadia = Miaasa. MIARA: Minimalist, understated and focusing more on quality, less on quantity. MIARA: Inspiration is everywhere; you can find it in narrow alleyway, an interesting tile, a quaint window, a strange looking plant and all the coloursof the sky. SAADIA: Creativity is the unflinching passion to innovate. MIARA: It was a hand-worked espadrille in a rich teal velvet. A lot of thought, time and planning went into it and the upper part actually turned out to be lovely. However, when we went it came to assembling the shoe, it was kind of a disaster! The placement was off, and somehow we still haven’t gotten around to adjusting it (haha). Maybe someday that poor shoe will hit the market. We have our fingers crossed! 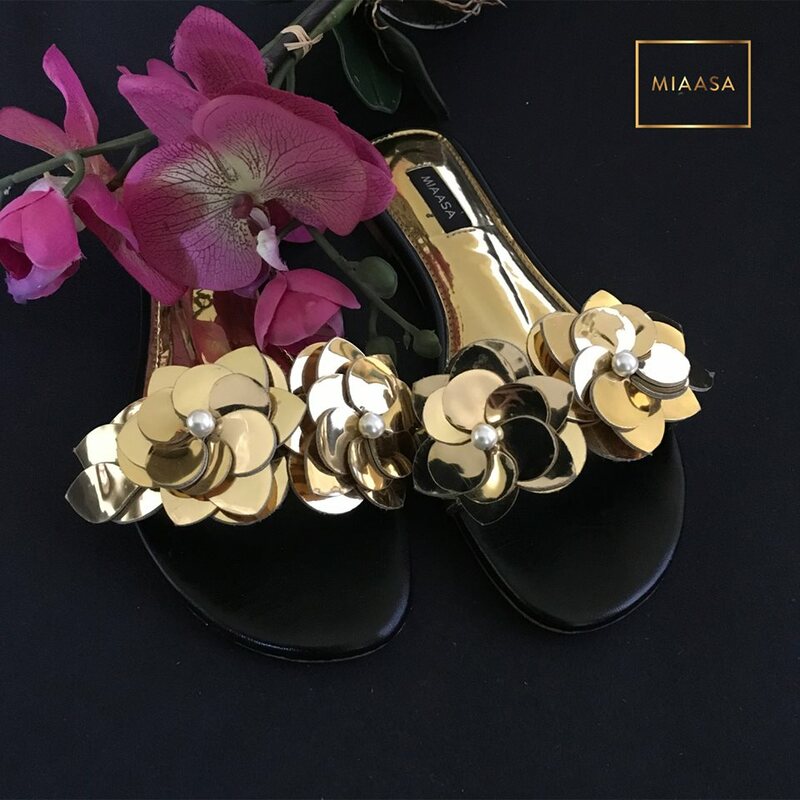 MIARA: They’re all equally special to me, but I live in our liquid gold sandals. 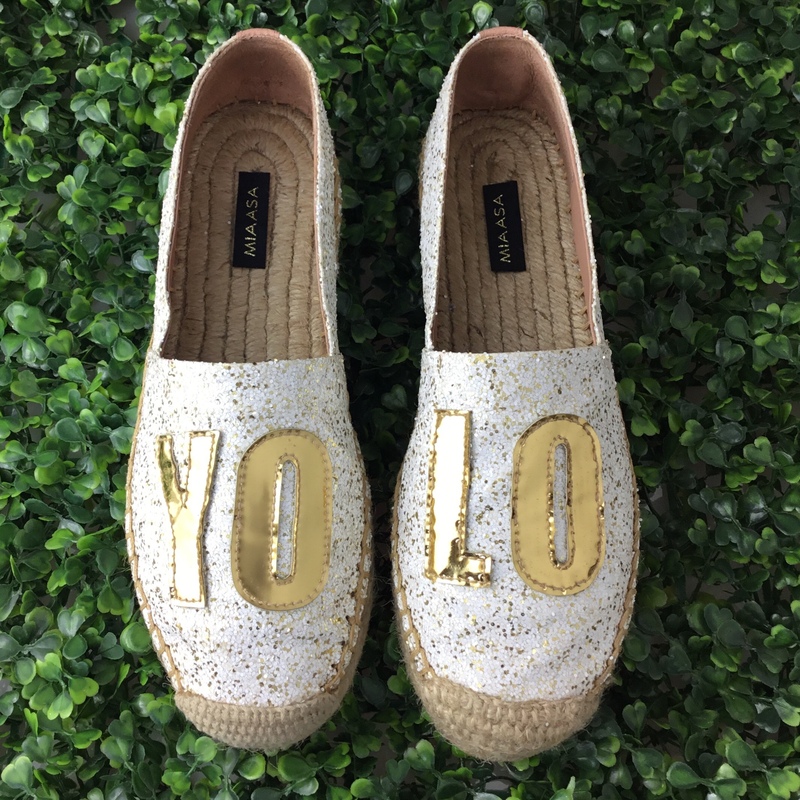 SAADIA: The tassel flats and glitter espadrilles. Miara often has to hold me back because I’m obsessed with glitter, and you’ll always find me trying to add a hint of sparkle to every shoe. 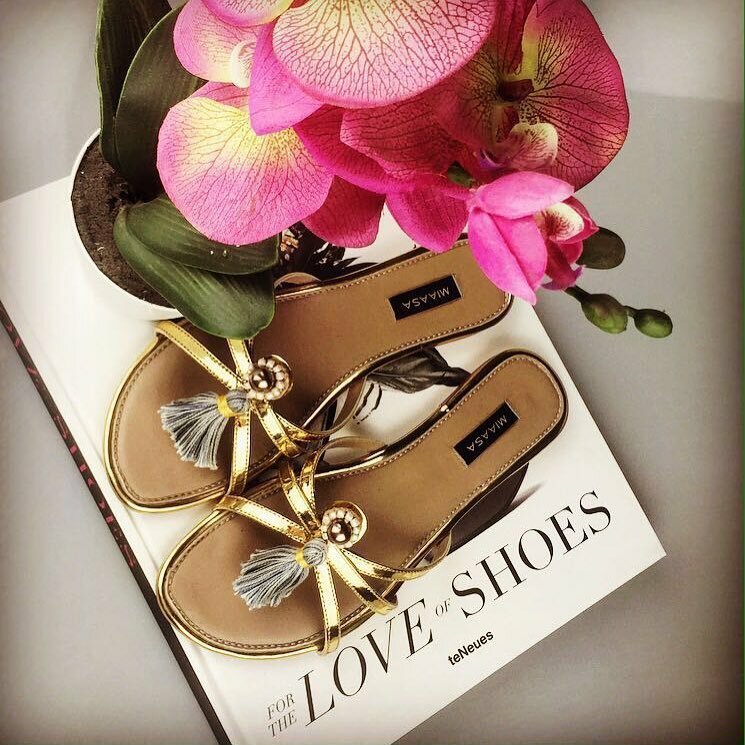 MIARA: The Liquid Gold and Cinderelli flats. Both can be dressed up or down to go with literally anything. SAADIA: Our velvet crossovers. They’re simple, but the jewel toned velvet and gold combo makes them look so rich. Plus, they are unbelievably comfortable. MIARA: I think it comes naturally to be honest. We’re both super involved in all aspects of the business and are pretty quick to claim responsibility for new tasks that keep coming up. Saadia is the more creative one and I often need her help when visualizing something new. SAADIA: So far we’ve both been juggling lots of different hats. Miara is definitely more of the CFO because I run away from numbers. MIARA: Being answerable to no one but yourself. SAADIA: Having your own office that feels like an extension of home. IF YOU COULD DESIGN A PAIR OF SHOES FOR ANY ONE CELEBRITY, WHO WOULD IT BE AND WHAT WOULD YOU MAKE THEM? MIARA: I would do a hand painted boot for Rihanna, with her song lyrics on it. Something fierce and out of the ordinary. SAADIA: It would have to be for Iris Apfel, and would be something bold and experimental. I’m thinking a wedge with an eclectic pattern all over, some feathers here and there and definitely some vintage buttons. MIARA: From my dad. He is a living example of how one should be happy with what they have while working to get what they want. SAADIA: From my mom “har pai pai kahi saab rakho!” (the ultimate Memon motto haha). SAADIA: Launching the MIAASA website followed by our heels, wedges and espadrilles line!